A lot of our customers first come to us through word of mouth – recommended by other decorators and friends. We serve both trade and retail buyers with the same absolute dedication to satisfaction. Our store has a good selection of wallpapers and trade and designer paints, and virtually anything you might need for decorating jobs. What we don’t have in stock, we can order into store for you within a few days. We have a kids’ area to occupy children if they’re with you while you browse our wallpaper collections, and our team has a lot of technical product expertise, so if you ever have any questions, please just ask. 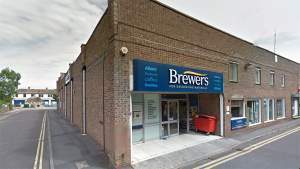 The Brewers Decorator Centre in Trowbridge is next to the Shires Shopping Centre. Take the turning off Wicker Hill just before you cross the River Biss. Follow the building round past Aston Interiors and we’re at the end. We have customer parking and straightforward disabled access. Head south-west on Fore Street/B3106, turn left into Wicker Hill, follow the road around and the store will be located on the left. Head north on Fore Street towards B3106, follower Wicker Hill and turn left onto the first turning. The store is located down that road on the left. Head east on Wicker Hill, take the first right after the bridge, follow the road round and the store is on the left.